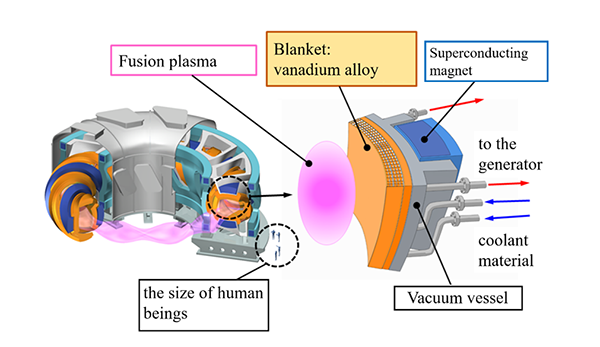 In the future fusion reactor, plasma is confined by using the magnetic field inside the doughnut-shaped vacuum vessel. The blanket is in a location where it almost touches the plasma, and as if to enfold the plasma the blanket is placed on the inner surface of the vacuum chamber. The blanket, by absorbing the high-speed particles generated by the fusion reaction inside the plasma, releases heat and a higher temperature is achieved. Then, cooling materials are passed through piping in the blanket, and heat is taken out to outside. Using that heat, hot water is heated and produces steam to power the steam turbine. At this time, the blanket is expected to be at the high temperature of between 700 and 800 degrees℃. For this reason, in order to achieve long-duration and stable electricity generation it is necessary to newly develop material that is strong at high temperatures, and use that material in manufacturing the blanket. Conversely, in general, the high purity of metals invites the weakening of their strength. And even NIFS-HEAT-2, too, shared the same worry. However, we were able to confirm to maintain sufficient strength under the conditions envisioned for the fusion reactor blanket in the following strength test. In the strength test, in order to simulate the conditions of the fusion reactor, we heat the material to the high temperature of 800 degrees℃ and set a fixed load. The materials gradually extend and change shape, and eventually break. As a result of measuring time to breaking off, under a load of below 1,000 atmospheric pressure (stress equivalent to a weight of 10.3 kilograms per millimeter squared) envisioned in the fusion reactor’s blanket, the time until it breaks off does not change even for high purification. Thus, we learned that the strength can be maintained. The blanket is colored in orange, and the combined weight of the reactor exceeds 1,000 tons. The blanket collects the high-speed particles that have emerged from the plasma in the fusion reaction and converts that kinetic energy into heat. 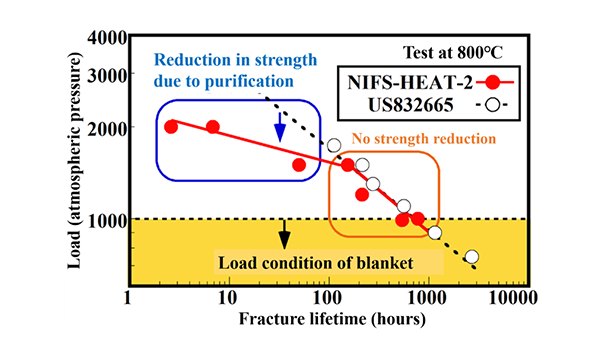 Image 2: We measured the time until the vanadium alloy NIFS-HEAT-2 under the fixed load broke off (fracture lifetime) and compared it with test results of the vanadium alloy US832665 produced in the United States, with many impurities. At a stress exceeding 1,500 atmospheric pressure, strength degrades, however under the blanket condition of below 1,000 atmospheric pressure, we confirmed that strength is maintained.